MultiBrief: Vaping vs. smoking: Is one better for oral health? Vaping vs. smoking: Is one better for oral health? The trend of replacing cigarettes with e-cigarettes is gaining traction around the globe. Many smokers are opting for the electronic substitute (also known as vaping) to improve their health, while others believe that both are equally detrimental to a person's health. Dentists need to broach the subject of smoking with their patients and dig deeper to fully evaluate what those in their care need to know. The good thing about e-cigarettes is there is that they do not contain tobacco, a major destroyer of oral health. Since e-cigs use heated water vapor, they are also considered to be smokeless, which removes many carcinogens from the habit. In fact, a Public Health England review claimed e-cigarettes are an astounding 95 percent less harmful than traditional cigarettes. The vapors come in many flavors and strengths, and are commonly used as a "stepping stone" for those who want to quit smoking altogether. However, there are no studies that prove their efficacy in cutting a smoking habit. As with any heated inhalant, increased temperatures damage cell walls in the lungs, mouth and throat. This damage can lead to oral, esophageal and lung cancers. Like cigarettes, e-cig solutions almost always contain nicotine, a habit-forming chemical. Nicotine can increase the likelihood of developing periodontitis and can also mask the diagnosis of early gum disease from dental professionals. 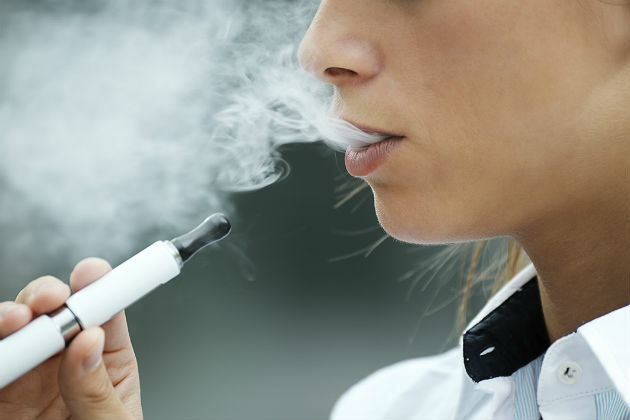 E-cigarette usage can also lead to inhalant-related problems, like emphysema. The new trend attracts younger users as well. Teens are more likely to try an e-cigarette than a conventional cigarette. A surprising 19 percent of surveyed middle and high schoolers surveyed admitted they had tried vaping, as reported by the National Youth Tobacco Survey. Because vaping is currently in vogue, and has been for a few years now, it may be difficult to dissuade teenagers from trying it. A study by the New England Journal of Medicine explained that e-cigarettes contain propylene glycerol. When heated at extreme temperatures, propylene glycerol creates the byproduct formaldehyde. This well-known embalming substance is a toxic chemical and carcinogen, and is probably the last thing people want to inhale. The study then purported that typical vapes, or e-cigs, can release formaldehyde during a regular vaping process. However, many experts claim that commercial e-cigarettes can't reach the high temperatures necessary to release formaldehyde. Conventional cigarettes can also release this dangerous substance, but again, usually at temperatures higher than the average smoke. Regardless of technique, inhaling any substance clearly leads to chronic health problems. Patients need to be made aware of the potential dangers of vaping, especially in relation to their overall well-being. While many tobacco researchers argue that e-cigarettes are 80-95 percent less harmful than cigarettes, vaping is obviously more harmful than not smoking at all. Speak with your patients if you suspect they are using cigarettes or e-cigs, and offer possible alternative ways to help them kick the habit.